PART III: THAT CAN-DO ATTITUDE — WHATEVER! I took a small hiatus from the “can do” posts, but now, I’m back to complete what’s on my mind. I didn’t realize how much I had to say about the topic or how many craft projects I keep on the backburner and work on. I’m not an expert sewer. I can sew the most basic pillowcase, and someday, I would like to sew fancier pillowcases (the kind with three different fabrics or two fabrics and trim). The how-to videos and reading instructions confuse me despite the promises of “it’s so easy and simple!” Hmmmmm. I beg to differ. I could totally be wrong, too — I probably am wrong. Two sets of pillowcases that I made -- nothing fancy. Just simple pillowcases. I love sewing — it relaxes me. If the project turns out well, then I’m happy. Sometimes, I want to learn more. Sometimes. Last summer, my friend and I took a basic sewing course that showed us how to make a simple sleeveless shirt. The shirt is cute — just not on me. Also, my patience was very much tested when I had to iron all of the creases and whatever. 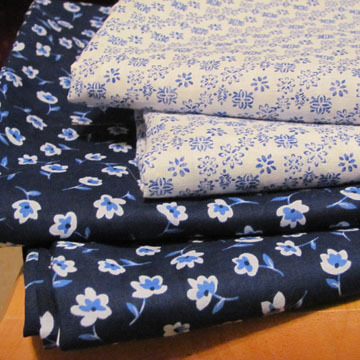 I would love to make a cute and simple summer dress, but I don’t think I have the patience. Although the time and effort would be worth it if the dress turned out nicely and made me fanstatically happy. I think what makes my can-do attitude worse are my sisters, Krissy and Becky. Krissy can make cute little skirts for my niece, Tova, out of old T-shirts. I would totally try to do that if I had a daughter. Becky made some animal pillows for her two sons for Christmas. She bought two pillows and two stuffed animals. She cut the animals in half and sewed each half to the pillow ends. Adorable. I would totally do that if I had two sons. Or maybe not. Agh! 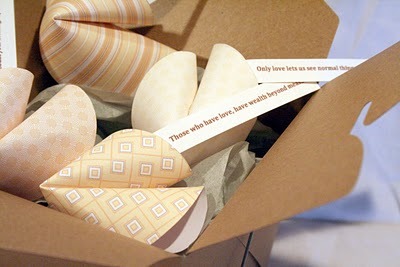 Why don't MY paper fortune cookies look like these? And I’m also glad I’m not alone with that can-do attitude. Judging from some of the comments from the previous two posts, other crafters have the same issue: “I can do that!” Some crafters are pretty smart to limit the number of projects and know which projects are enjoyable and fun. After exclaiming “I can do that,” other people think, “Really? Will I really make this item?” As much as I would love love love love to learn to decorate cakes, I know I don’t have the time, money, and room to take up another craft. At least I know my limit on some projects. 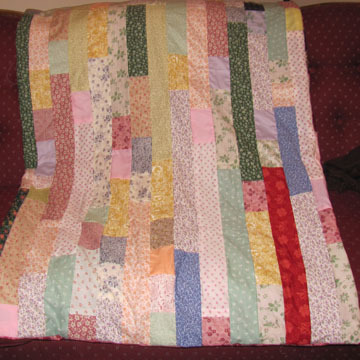 And to the readers who recommended strip quilting: my unfinished quilts are actually strip quilts. Starting the strip quilts are fun and easy, but completing them is another story! But I have faith that I will complete the quilts one day — one day. Do you ever feel really frustrated when you CAN’T master a craft? Months ago, a blogger shared instructions on how to make paper fortune cookies, and I thought, “Those area really, really, really cute. I can do that!” Before even trying to assemble the cookies, my imagination got the better of me. These cookies would make really cute and simple gifts for friends. I have a ton of scrapbooking paper, and the end result would cute and awesome! Only one problem: my paper fortune cookies look nothing like the ones in the picture. What the crap am I doing wrong? Why don’t my cookies look pretty? I tried circles of different sizes and heavier or lighter paper — none of the adjustments made my fortune cookies pretty. My first completed strip quilt. It's not perfect, but I still think it's pretty. And when do I quit trying? I haven’t tried making the paper fortune cookies in a very, very long time, but the project is still in the back of my mind. Every now and then, I think, “I can do that. I just need more time and patience. I can do that. I can make pretty paper fortune cookies.” When I do let those thoughts go? Some projects I can give up easily — knitting, cake decorating, snowman ornaments — but why can’t I say no to other crafts? Why is the paper fortune cookie still haunting me? Well, this post concludes that can-do attitude! Thanks for reading and commenting. And please refrain from introducing me to any new craft items or projects as my craft plate is pretty full right now. On second thought, I can always think about the new project and then make a decision, right? The strip quilt is gorgeous!!!!! So what was the method for putting it together??? ?